Is motherhood a career? An identity? An escape? A calling? Your identity is in this constant state of chaos and change and influenced sometimes positively and sometimes negatively. What this leads to is a very inconsistent emotional and spiritual life. These are the things that may explain you, but they do not define you. I have long struggled with the idea of motherhood as a “career,” and spent many difficult hours in prayer and conversation about my own journey towards motherhood. My eventual decision to leave my full-time job at Carnegie Hall in pursuit of a combination of freelance opportunities in performing, writing, and consulting that would also allow (“allow”) me to serve as the primary caretaker of my first child and our home was . . . far from easy. The COO is responsible for the daily operation of the company, and routinely reports to the highest ranking executive, usually the Chief Executive Officer (CEO). The COO may also carry the title of President which makes that person the second in command at the firm. But do I appreciate this genial nickname that he has bestowed upon me – “Hollingsworth Family COO” – primarily because it gives a name to what I do? It somehow transforms the otherwise mundane-sounding title of “mother” into something that sounds like a respectable career, a title to claim and be proud of – one that connotes honor and somehow justifies the way that I spend my days. Why do I need a title, and a job description, to feel worthy, worthwhile? Why do I cling to these things to give me a sense of identity? I loved my job at Carnegie very much. Yes, it meant putting other career and creative ambitions on the back burner, but the work was wonderful and fulfilling and my team of colleagues amazing and inspiring. After the birth of our first son and those first eight weeks of haze and glorious moments and exhaustion and emotion, I felt conflicted about leaving him so soon to return to full-time work away. I didn’t have a new role at another esteemed organization. I couldn’t say, “I’m leaving because I’ve accepted this other great position.” I couldn’t tell them my new title, give them a new business card or phone number or email address. I had none. I wasn’t sure that I totally believed in why I was leaving. I was torn, and not at all certain that I wasn’t making a mistake. I was “just” going to be a mom? At least, for a little while, until I started to get other work sorted out? Why was it so hard to leave without another title, another job description to hold on to? Why didn’t I believe that it was enough to say I was leaving to be with my son, to be a mom? Yes, I was planning to pursue freelance work. Yes, I was eager to try on some new professional hats and put my varied experiences to the test. Yes, I wanted to get back to those creative dreams that had been simmering patiently for a few years. But I was also leaving to be a full-time mom. To do laundry countless times a week and plan meals and pay the bills and change thousands of diapers and spend hours on the floor reading Brown Bear, Brown Bear and singing The Itsy Bitsy Spider (that music degree sure comes in handy). And I wasn’t sure that I believed this was “worth” my time. Or “worth” my experiences, my expertise, my degrees. I thought I was worth more. Sadly, this doesn’t feel like it’s enough for me – being a MOM. I’ve continued to search for an identity, for the right words and titles and lines on my resume to shape my sense of worth. I am afraid of being defined solely, primarily, as a mother. I am afraid of allowing this identity to identify me. I am afraid that others believe that a MOM is somehow LESS. Less worthy. That a mom – who works long and grueling hours but does not receive pay, and has no concrete job description, benefits, or vacation days – is therefore not worthy of respect. I am afraid others believe this because I, too, have believed it. As I have watched my son grow and develop over the last twenty months, as I have explored my doubt and questions and jealousy with my therapist, I have slowly come to believe that being a mom IS worthy of respect, IS enough. And is possibly the most beautiful and important identity that I’ll ever have. My own mom gave me the above card when my son turned one. She told me it was true. And I believed her. 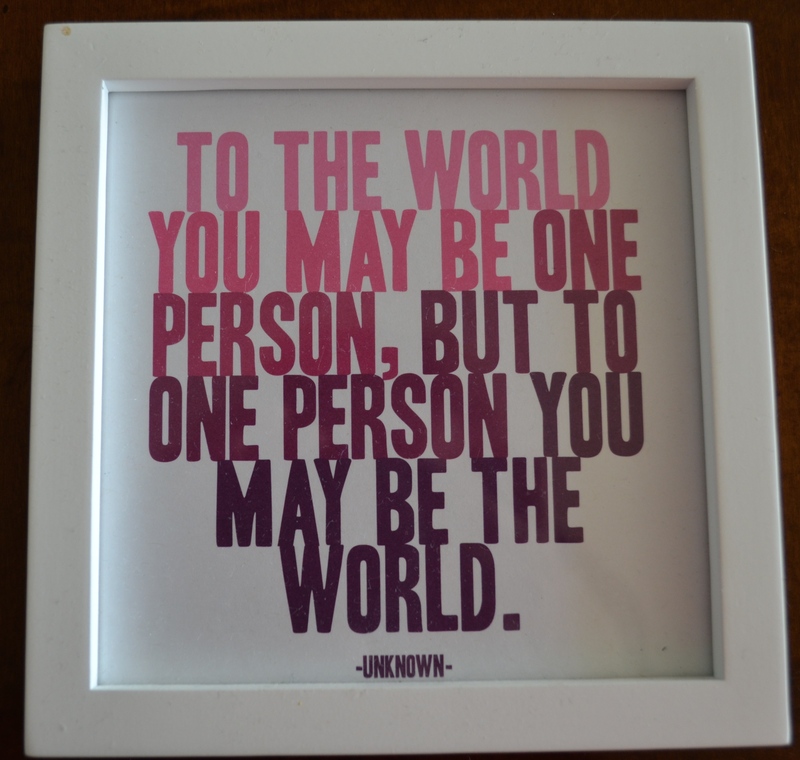 To the world, I may be one person, but to one person, I am the world. Everything my son learns about the world at this age, he understands through me. He sees and perceives through me. He senses when I am scared or angry, frustrated or tired or sick. He intuitively picks up on my emotions and moods and stores away each bit of information in his sponge-like mind. I convince him to eat vegetables with an enthusiastic face and elevated voice; I soothe him after immunizations with songs and gentle touch. How could this not be the most important thing? Shaping a human being? Teaching him about the world? Loving him and nurturing him and creating safety and security for him so that he has the courage and confidence to explore and experiment? But it’s still a struggle for me. I envy my husband, who gets to go to work and ride the subway alone (alone!) and who can have lunch with a friend distraction-free without simultaneously paying a babysitter. I envy his career, the money he makes, and the way he is able to think about his time. There are terrible, frustrating, exhausting, grueling days. Days when I think, My son would be better off in full-time daycare. Days when I think I would love him more if I saw him less. But my heart tugs. I am his world. This is a privilege, a gift to be cherished, a short period of time that can never be replaced or recaptured. People around me (for the most part) reinforce this message. I try to listen to them on the days when the voices in my head are the loudest. I want to be one of them. I want to believe in motherhood as a career choice, as a viable vocation, as a worthy identity. I want to believe that it is enough to say: I am a mom. This quote from Mark Driscoll (pastor of Mars Hill Church in Seattle) came from a short article he wrote entitled What Does It Mean to Have an Identity in Christ? The advantage of working outside of the home is, no matter how hard you day was, you get to come home to this sweet lovable little cherub! The separation made the reunion all the more special! I do not think I could have stayed home and devoted 24/7 to taking care of you & your sister! And that’s why it takes all kinds! I couldn’t be more grateful for the kind of mom you were to us! So many women struggle with this question, and you articulated really well what I think many of us feel! My mentor and friend, who raised 2 boys and 2 girls, says something about motherhood that I love: You are building men and women. There is joy unspeakable witnessing your boys become men and your girls become women. Motherhood is diligently building and laying down a solid foundation. Parenting is not easy, but God has called us to this task (of building) and promised to help us, called us to be faithful in prayer, and in example and teaching … this is a long obedience! (Deut 6:5-7) Love the posts and blog, Leah, thank you for being so true.